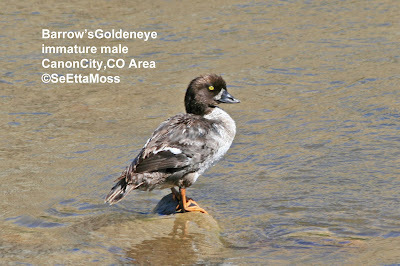 This immature male Barrow's Goldeneye has been hanging around the Arkansas River just east of Canon City,CO since July 25. As this goldeneye stretches and grooms, it provides nice views of it's plumage which I think is Alternate I that is found on first year birds. Most Barrow's Goldeneye are found in the far western mountains up to Alaska with a small breeding population found in Colorado in the Flat Tops Wilderness Area in nw part of the state. This young goldeneye is too young to breed (couldn't find anything about when males start breeding but most females of this species don't start until they are three years old according to All About Birds.org). Nevertheless it is far from where it should be at this time of year His lack of balance when he exercises his wings causing him to fall off the rock into the water may be an indication of his youth as younger birds often display poorer coordination than adults. SeEtta. Bear cub just 40 feet away! After an appointment in Pueblo, I detoured to the San Isabel National Forest near Greenwood, CO this afternoon. It was a little cooler and very peaceful as I was the only one in the area I drove into. I (and my 2 dogs who had been sleeping while I just enjoyed the quiet) had been very quiet for quite a while, I stepped out of my car. When I turned around to get back in the car I was very surprised to see a bear cub just 40 feet away on the other side of the car. I quickly but carefully got into my car to get my camera trying not to scare the young bear. However, it had stood up on it's back legs to smell the air and as soon as it got a whiff of human it ran quickly into a nearby gulch and I never got a chance to get a photo. Much to my surprise as I walked across a bridge over the Arkansas River at Texas Creek, CO yesterday this young Common Raven flew onto a fence about 15 feet in front of me. 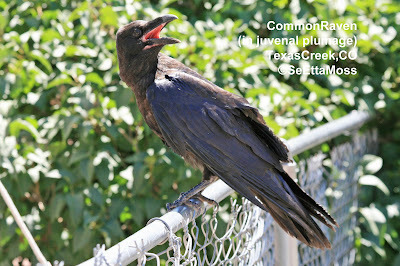 I had earlier heard some muffled calls that sounded sort of like a Common Raven and they must have come from this bird. This Common Raven is quite young, possibly even a fledgling or not long since it was. It has a very pink mouth lining with a still some pink on base of bill. Eyes are grayish though somewhat difficult to see in these pics. Plumage brownish-black with wing and tail feathers glossy (supposed to be green or purple gloss but it looks like a blue gloss to me). >human voice noise resulted "in decreased vocalizations (37% decline) and decreased physical sightings (44% decline)." >of conservation concern: "As vocalization is involved in territory defense, breeding behavior, and predator detection, strong noise responsiveness indicates potential harm for birds. Insectivores were the most affected bird guild, raising conservation concerns, as insectivorous birds are sensitive to habitat modification"